I’m so happy to present a guest post from Brianne Miers, another female traveler who (as you will learn) has seen it all. Throughout my professional career, I’ve had almost every kind of workspace there is – a private office (LOVE! ), a shared cube (LOATHE) and even a converted closet (Yes, that’s true.) 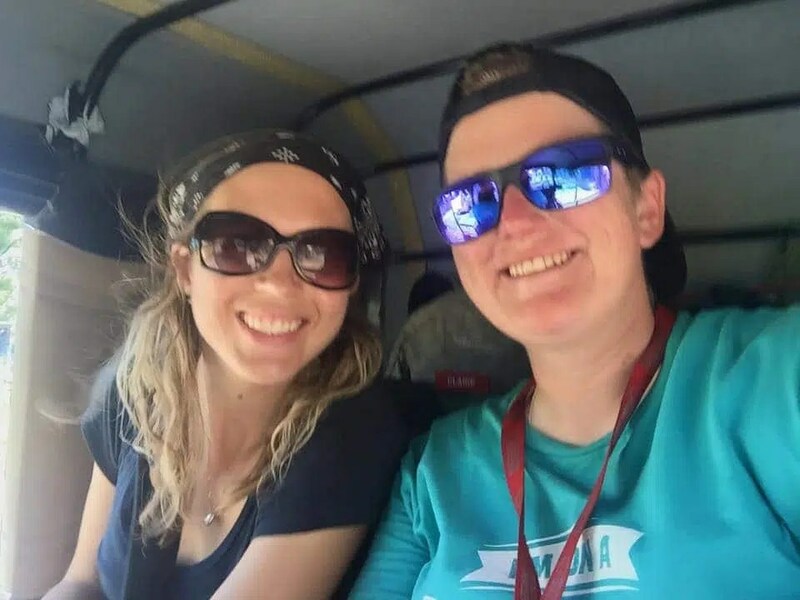 And now – thanks to spending seven weeks traveling throughout southern India managing an adventure travel company’s social media – I can add “auto rickshaw” to that list. 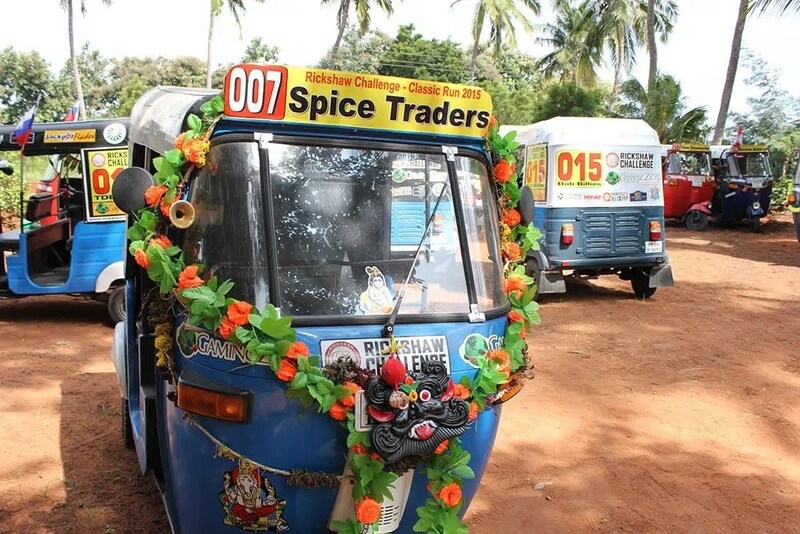 A few days into Rickshaw Challenge Classic Run 2015 – a wacky adventure rally that pitted 21 international teams against each other on a 1,000 km journey from Chennai to Trivandum – I decided I needed to experience the rally from an actual rickshaw, instead of the safety and comfort of the air-conditioned staff car. 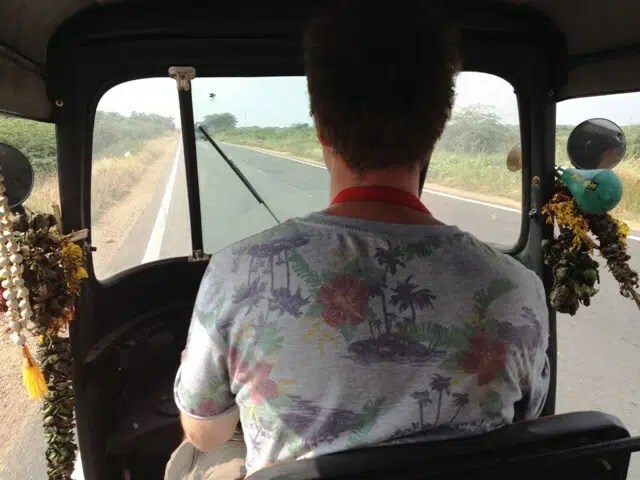 Norwegian team Game of Thrones was nice enough to let me hop on board with them, so I squeezed myself in the backseat next to Sindre, a bearded college student, as his teammate Kristopher navigated us – poorly, I might add – through and out of Madurai’s chaotic city center. 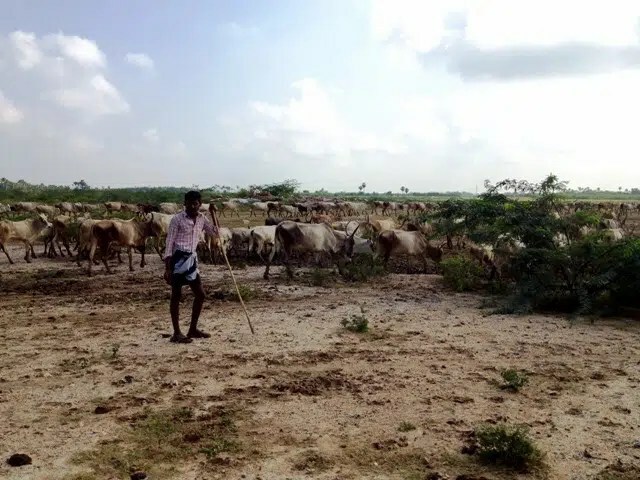 For the entire eight-hour drive to Tuticorin – as we cruised the smooth, straight highway and bounced along spine-crunching back roads – I live tweeted highlights of the day’s activities, which included swinging by a school to drop off some soccer balls, lunching at a surprisingly upscale highway restaurant, chatting with a lone shepherd driving thousands of long-horn cattle, getting lost in the expansive salt flats, and paying a visit to “Hitler’s tea stall” for the last challenge of the day (Yes, there is such a place). Luckily for me, the Game of Horns rickshaw was outfitted with wifi – the teams pay extra for the convenience – since that was the only way I was able to access the Internet on my iPhone during my entire stay in India. Riding along with Norwegian team Game of Horns. The travel company had given me a SIM card upon my arrival and then a series of successive SIM cards, as one after the other failed to do anything except spam me with hundreds of text messages that I couldn’t read. India makes it a lot harder than most other countries for foreigners to secure a SIM card from a local carrier – you have to fill out an application complete with the name and address of an Indian contact, and provide a photo, copy of your passport and anything else that the particular vendor might deem necessary for approval. I never really got to the bottom of why the SIM cards never worked for me– one explanation was that it was because I was using an iPhone. Although, while the SIM cards in my colleague’s Samsung did give him 3G access, he someone would somehow burn through 2GB of data within 24 hours. I also never got to the bottom of why it’s so hard to get a SIM card in the first place (one reason offered was national security concerns). As I learned many times during my stay, some things in India defy explanation. By the time I got to the hotel that evening, and every evening of the 10-day challenge, I was craving not only a meal and a shower, but an outlet to charge my various devices – iPhone, iPad, camera, portable battery pack, and portable wifi hotspot, which also never seemed to work as it was supposed to – and the hotel’s wifi password. All of the hotels we stayed in claimed to provide wifi in some capacity. However, in reality, the actual availability and signal strength varied widely. Most hotels, like the one in Tuticorin, only had a signal in the lobby. Others had an individual password assigned to every.single.guest – and since you could only get one, no luck using both your phone and tablet. Often, the wifi didn’t work at all. Upon informing hotel staff, though, I was usually met with a disinterested shrug. Even if I was able to connect to a network, given the glacial Internet speed I encountered throughout the country – India is 52nd in the world, according to a 2013 report, whereas the U.S. is 12th – one post to social media could take 30 minutes or more. Often the site would freeze or my login would time out, and I would lose my work. So I was often up until 11 p.m. or later, trying to publish my colleague’s daily blog post, a “photo of the day” and other updates throughout the company’s various channels. Then I was usually working by 6 a.m. the next morning, scheduling the day’s Facebook posts and Tweets before we hit the road. Sharing the back of a rickshaw w Lisa from the NZ team Flying Kiwis. These annoyances, however, were well worth the experience of flying by gangs of excited school kids and dodging dozens of holy cows on each day’s adventure to the next city. By far those were the best days I have ever had at the office. Brianne is the principal of Kind Communications and blogs about how to balance professional careers and travel on her blog, A Traveling Life. Thanks so much for sharing my story! I love it!